Traditional history of the Coast Salish people. If you have enjoyed and found the information on the Coast Salish very useful, and you would like to make a donation. Coast Salish languages: The Coast Salish languages include several different dialects: Northern Salish (Comox, Pentlatch, Sechelt), Central Salish (Squamish, Halkomelem, Nooksack), Northern Straits (Sencoten, Sooke, Lekwungen, Lummi), Clallam, and Southern Salish (Lushootseed, Twana). 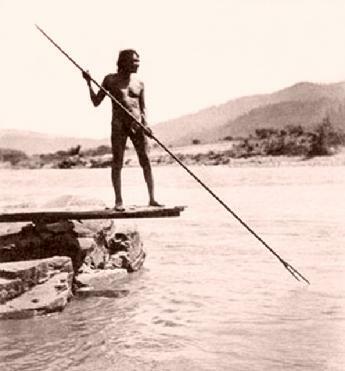 Presently the entire Coast Salishan languages are endangered and facing extinction. Some of the Coast Salish dialects have only three or four people left that speak and understand their original Salish language. Historically, there were many Salish people that could speak several of the Salish languages, and they would serve as the diplomats, traders, and interpreters when encountering members from other Salish tribes. At one point in Indian history a trading language existed between the various Indian Tribes, this language was called the Chinook Jargon. The earliest European records of contact with native people in the Pacific Northwest contain what appears to be the Chinook Jargon. This tends to suggest that the Chinook Jargon was already in existence, and well used by the Indian people when the Europeans arrived. 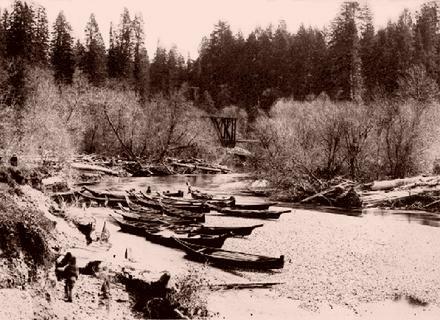 Towards the end of the nineteenth century Chinook Jargon was in extensive use throughout the Pacific Northwest. Here in British Columbia it was used extensively on the Coast, in the South, and especially along the Fraser River. European settlers learned it and used it to communicate with the native people. The Missionaries gave sermons in Chinook Jargon and published hymns, prayers, and catechisms in it. The various native languages that contributed words to the Chinook Jargon had a number of sounds that were unfamiliar to, and very difficult for the Europeans. These included the glottalized consonants, the voiceless lateral fricative, and the lateral affricates. When native people learned the Chinook Jargon from other native people, they generally preserved these sounds. However, Europeans usually had great difficulty pronouncing these sounds and changed them into more familiar sounds. 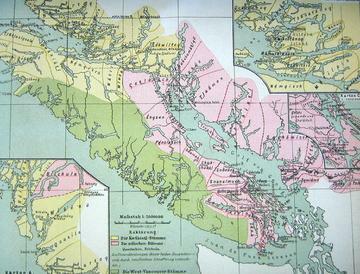 Coast Salish Territory is demarked in pink (above) in one of the first maps to depict Indian territories in BC, published in 1887 by ethnologist Franz Boas. With the English language being so widely used the Chinook Jargon became unused, and is now considered to be extinct amongst most of the Coast Salish tribes. For more information on the historical Chinook Jargon trading language click here. 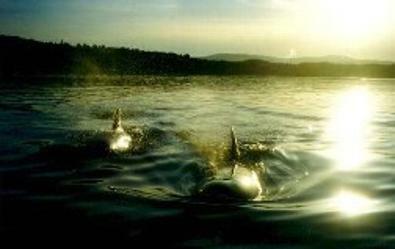 The tribes of the Coast Salish have traditionally occupied some of the best inland coastal areas of British Columbia. The Coast Salish territory includes the Northwest Coast from the mouth of the Columbia River (Oregon, USA) north to Bute Inlet (BC). The Coast Salish Territory includes much of the ecologically diverse Georgia Basin and Puget. This huge drainage basin comprises the coastal mainland and Vancouver Island from Campbell River and the Georgia Strait south through the Strait of Juan de Fuca, the Lower Fraser Valley, and the lowlands of Puget Sound. The archaeological evidence of Coast Salish occupation of these resourceful lands dates back some 12000 years. Strait of Georgia: The Strait of Georgia is an incredible piece of real estate when you look at it as a whole. The length of the strait is not great; it is not more than 125 miles from Orcas Island near the southern end of Vancouver Island to Cape Mudge on Quadra Island. The total ocean frontage, however, is remarkable. If you calculate the length of shoreline (including all indentures and measurable islands) within the boundaries of the Coast Salish speaking groups, and set the traditional salish northern limit with an arbitrary line extending eastward from Salmon Bay on Johnstone Strait and use the international boundary as the southern limit. The length of all shores in-between these two lines, have a combined total of over 1,900 miles of some the most remarkable shorelines in British Columbia. The configuration of land and water in this region has other important considerations from the standpoint of human occupation and control. The Strait of Georgia itself is comparatively narrow, with the existence of numerous offshore islands that traditionally helped provide shelter and food, as well as further reducing the necessity for long canoe voyages when travelling back and forth between Vancouver Island, Gulf Islands, and the mainland. Even at its widest part toward the southeast, the greatest east-west distance between any two points of land does not exceed twenty-five miles. Coastal Weather Conditions: The warm Japanese current striking the coast of British Columbia and curling both to the north and south makes this entire region one of moderate temperatures. The extremes of temperature known to other parts of Canada do not occur here. The prevailing winds are from the west, and since they are warm and moisture laden, considerable precipitation results from their ascent of the western slopes of the Vancouver Island mountain barrier and the Coast Mountains on the mainland. The average rainfall for the Salish Strait of Georgia is between 150 and 200 days, with most of the precipitation falling in the winter months. Moderate snowfalls occur from December to February, with July and August being the hot and dry months. Raw Natural Resources Of The Land: In the moist and temperate forests of British Columbia, limitless stands of cedar supplied the Coast Salish people with raw materials. The western red cedar was used for canoes, houses, clothing, and tools. 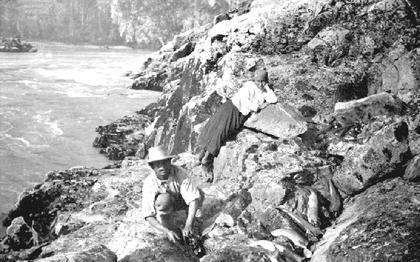 The Salish harvested salmon and coastal shellfish as their nutritional mainstay, and supplemented their diet with deer, elk, moose, bear, migratory birds, medicinal plants, roots, herbs, and berries. Herring were abundant everywhere. Halibut generally spawn in twenty to two hundred fathoms of salt water and are found in the southern parts of the strait. Eulachon (or candlefish) ran in enormous quantities in the Fraser River, as well as in Bute Inlet. Sturgeons were also caught in the Fraser River, they usually entered the river system around the end of April, following the eulachon run. Other fish such as flounder, dogfish, cultus cod, red cod, and rock cod, etc., are found in the Salish territories. 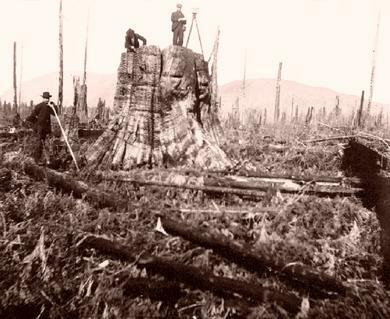 Within a short period after colonization, the pristine traditional hunting and fishing grounds in the Coast salish territories were destroyed by the combined forces of logging, mining, saw mills, fish canneries, urban sprawl and hydro dams. Much of Vancouver and Victoria has been built on the top of vast shell middens and other ancient Indian archaeological sites. Interfamily Connections: The Coast Salish tribes of British Columbia consist of many interconnected communities or tribes. 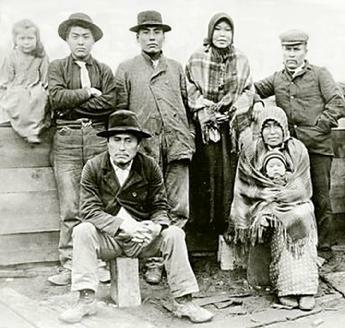 Traditionally, the Coast Salish communities have all at some point in time been interconnected through traditional marriages, extended family adoptions, or transferring from one band (or tribe) to another. Historically, the Coast Salish has used an oral account that traces their connections from one family or community to another. This oral account has been done for thousands of years through Longhouse ceremonies (primarily when receiving a traditional family name or privilege), trading, intermarriage and the sharing of the natural resources. 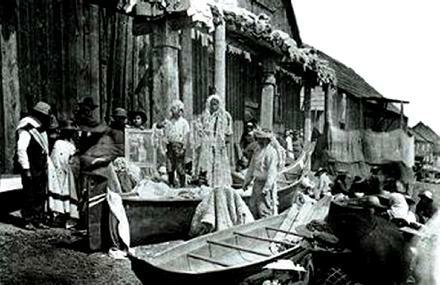 Traditional Villages: With a large linguistic population, and like the other coastal tribes of British Columbia, the Nootka, Kwakiutl, Haida, Tsimshian, Tlingit, and Bella Coola, the Coast Salish villages were located near the mouths of rivers, or on sheltered bays, or inlets out of the reach of storms and held strong vantage points for any attempts from marauding strangers. The winter villages were always regarded as the permanent houses that held traditional winter ceremonies from November until at least March. The summer camps were temporary, and the food gathering was the most essential element for survival. During the spring, summer and fall months there simply was no time for play, and very little time for traditional ceremonies. 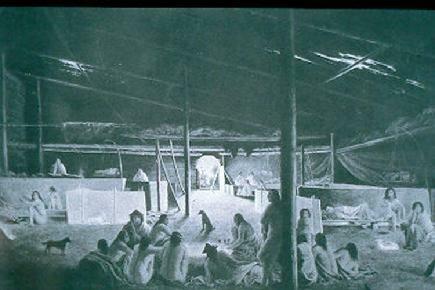 Coast Salish shelter and housing: Coast Salish shelter consisted of two types: the shed (single-pitched) roof, and the gabled roof. Several families could be accommodated in these traditional dwellings. The shed houses were most prominent in the southern parts. Towards the north they tended to mix with, and gave way to, the gabled type. The gabled house: The essential part of the gabled house was, of course, the ridgepole. This was supported by either two or four posts at the ends and one or more under the middle part, according to its length and strength. The walls were of broad planks, sometimes three or four feet wide, as well as smooth, and flat. The shed house: The shed structure was simple. Four posts were set in the ground at corners, two posts in the rear being slightly shorter than those in front. Two parallel timbers were then fitted on top from the high to the low post, their length determining the length of the house. Usually this was sixty or seventy feet. If the strength of the timbers could not be relied upon, additional supporting posts were set under them. Poles were then lashed on the timbers at intervals across the width of the house. The roof planks rested on these poles. The incline was very slight and drainage was to the rear. 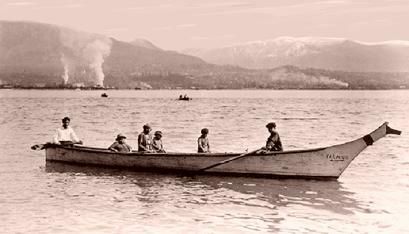 Canoes: The Coast Salish have always been canoe people, and traditionally were excellent seamen (probably not so much today). The Coast Salish dugout cedar canoes generally ranged from 14 to 26 feet in length, and the largest canoes could carry a whole family and all their traveling gear. Throughout the seasons, even the open parts of the Strait of Georgia could be crossed in dugout canoes. Neither the traditional larger style ocean canoes, nor the seamanship for rough seas were really required. 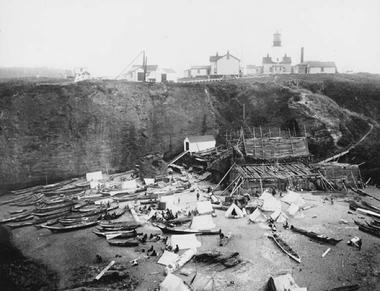 The challenge for ingenuity in canoe building was not so provocative on the strait, as it was on the rougher seaboard of the west coast of Vancouver Island. 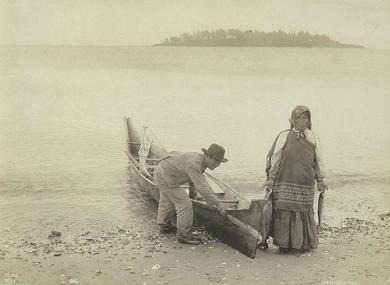 Historically the canoe skills of the Coast Salish would not have matched those of the Nootkans. The Nootkans were very well known and respected for their seamanship in rough oceans, and their whale hunting abilities. The Salish style canoe did go through a change in the mid 1800’s. The change may have been as a result of intermarriage, trading, or just simply adapting styles. By the late 1800’s, the Salish style canoe strongly resembled those of the Nootkan style wolf head canoe, and over the years it has become a very accepted traditional style of the Coast Salish culture. Body Ornamentation: General practise with the Coast Salish was the deformation of the heads of their infant children. Heads were deformed in infancy by binding a cedar-bark pad tightly against the forehead under a strap tied to the sides of the cradle. The primary reasons for this custom was mainly aesthetic. A flat forehead and wide face were considered handsome; narrow features and a bulging forehead made one look like a “dog”. There was no clearly conceptualized association of the deformed head with aristocratic attributes. Everybody had it, with the possible exception of the born slave. Men cut their hair to shoulder length or parted it in the middle and caught it up with wooden pins in a knot at the back of the head. The latter style was usual for men at work or when going to war. Otherwise, long hair was inbound and fell disheveled about the face and shoulders. Women did their hair in two braids on either side of their heads from a center part. At puberty the girl's hair line was raised slightly on her forehead by plucking her eyebrows were thinned as marks of beauty. Clothing: In traditional times, in the summer months, the old men went about naked. Even in Paul Kane’s day this was true. The young and the middle-aged men generally wore a belt to which was attached a small free-hanging front covering of shredded red-cedar bark or deerskin. 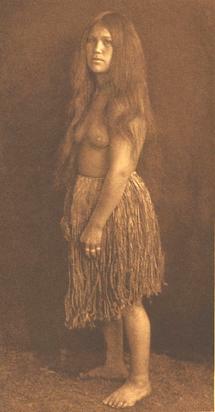 Woman wore a knee-length skirt of wool, deerskin, or shredded bark. Everyday clothing consisted of full size raw animal skins, usually with the fur on, with an area cut out for the head and strapped around the waist. Buckskin Dress: Buckskin clothing was worn by men hunting in the mountains, and by the woman during the winter. Buckskin outfits were not for ordinary dress. Not everyone could get the skins, and still fewer people knew how to prepare them. 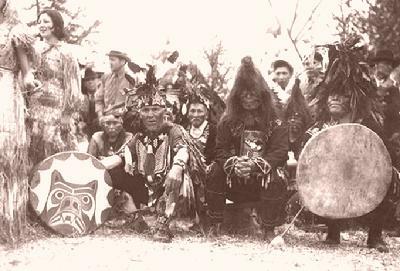 Buckskin clothing was therefore a very well respected feature of the Coast Salish winter dances. Goat Wool: Goat wool was even more of a luxury item, and a mark of social prominence compared to buckskin. It was especially scarce and very expensive on the island, and only rich men’s wives and daughters could afford and wear aprons of this material. Class lines: With the Salish, class lines were not well defined. There was no point above, which a man was of the aristocratic class, and below, which he was a commoner. Leadership: With the Coast Salish, the highest unit of common allegiance was the extended family. Salish canoe in Vancouver harbour, 1890. The Salish historically did not have “chiefs” as that word is commonly understood. There was no single tribal Chief, council, or tribal officers. The Headmen (referred presently as chief) of each of the families houses that comprised the village, often conferred together conversationally over any tribal concerns. The term “chief” is a government-applied term that was popularized through non-native writers, and non-native people in general. Aboriginally, Headmen and all other important men were called “siem”. The translation best conveying the meaning of this word is “real man” or “rich man”. A Headman (chief) was not the representative of a heterogeneous group of constituents: they were his relatives, and although the family headman’s advice was frequently sought, he had no power whatsoever to enforce his own judgements or even the majority opinions of his house associates. The average Salish person was not regarded as a commoner and his feelings were no different from those of any freeborn man, and no Headman (Chief) in the give and take of daily life could flaunt his superiority in the face of his social inferiors and expect their support and cooperation. The extended family normally lived in one large house, and the strength of a family lay in the numbers. Although any dissenter was free to do as he pleased; it was usually the Headman’s abilities of speech in regards to knowledge, honor, respect, and common interests that convinced the other Headmen and family individuals in the final course of decisions or actions. The Coast Salish traditional way of life, like all Native Indian tribes, displays a fine and fulfilling balance between man, woman, and the natural and supernatural worlds. The links below provide a small glimpse into a few of the traditional practises, beliefs, and legends that still exercised and told to this very day.